Unlike the big guy, you might actually like her when she's angry. 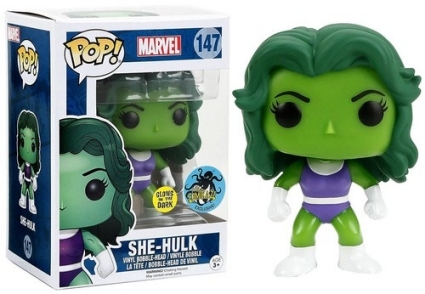 Funko Pop She-Hulk offers a handful of options for the colorful hero. Included in the main Pop! 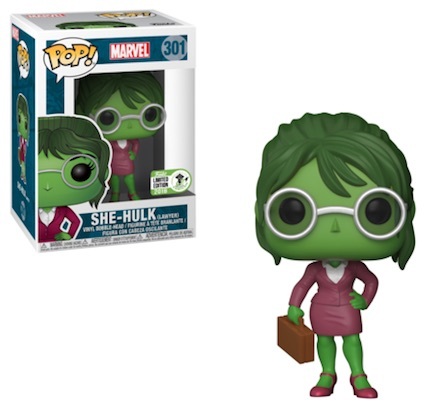 Marvel line, the first Funko Pop She-Hulk figure features the gorgeous lawyer fully transformed with dark green hair and the famous lime-colored skin. As with the main She-Hulk, the Comikaze glow-in-the-dark variant dons the always popular purple unitard. Shop for Funko She-Hulk Figures on Amazon. In contrast to her famed cousin, Bruce Banner, a.k.a. Hulk—who has a few Funko Pop! vinyls of his own—Jennifer Walters (She-Hulk) is able to control her powers and keep her wits while transformed. On the other hand, Red She-Hulk (Betty Ross) is more similar to Banner and is rather unstable. 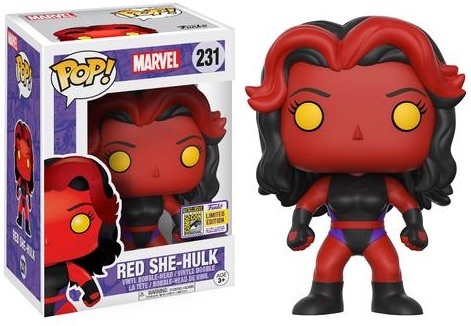 The stylized Red She-Hulk figure is a 2017 San Diego Comic-Con exclusive. 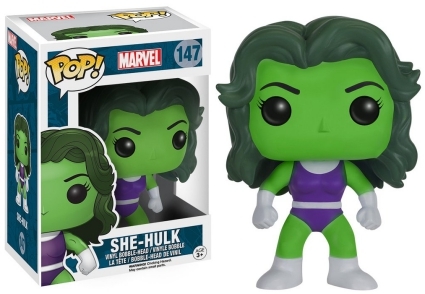 Although the Funko Pop She-Hulk set is relatively small compared to other superheroes, She-Hulk has a plethora of cardboard options available. Check out some of the trading card sets that include the Jade Giantess on the "More" tab above. See more details on related vinyl collectibles with our other Funko Pop guides. You can also review the various Marvel trading card sets that feature She-Hulk.